Listen to the Fighting Through podcast, produced by Paul Cheall, telling the stories behind the story. You'll be £19.99 closer to your next £10.00 credit when you purchase Fighting Through from Dunkirk to Hamburg. What's this? First and foremost a Green Howard, he saw the sharp end of the Nazis' Blitzkrieg and was evacuated exhausted. Next step, courtesy of the Queen Mary, was North Africa as part of Monty's 8th Army. After victory in Tunisia, the Sicily invasion followed. The Green Howards returned to England to be in the vanguard of the Normandy Landings on GOLD Beach (his colleague, Sergeant Major Stan Hollis won the only VC on 6 June and Bill Cheall was wounded). Once fit, Cheall returned to the war zone and finished the war as a Regimental Policeman in occupied Germany. A soldier's harrowing account of being in the first wave of troops to land on Gold Beach on D-Day has been preserved for future generations...[Bill Cheall's] memoir serves as a valuable record of the war. Bill’s many and varied experiences make fascinating reading. He tells his story with modesty, humility and humour. THIS memoir of a Green Howards warrior from Cleveland captures the essence of the British Tommy at war – tough, determined, patriotic and with a thirst to get the job done, but without any lust for glory. With the BEF at Dunkirk, where he survived the Stukas; with Monty in North Africa, where he helped to defeat the Afrika Corps, and after further campaigns in Sicily and Italy, eventually taking part in the D-Day landings and the Liberation of Europe, Bill Cheall saw it all, did his bit and, like most soldiers, was glad when it was all over. His recollections, edited by his son Paul, reveal the modest man aware of his own worth, with a courage that could not be broken and with a sense of humour that stood him in good stead in the tightest of situations. When the call to battle came, he answered it with a quiet strength that reflected well on him and the whole British Army. A dark time but a proud time and we should all be proud of, and grateful to, Bill and others who fought so bravely for us. WHEN Paul Cheall decided to publish his father’s wartime diaries, he never expected to discover his first car still on the road after more than 75 years. The Morris Ten, which predates the Second World War, belonged to his father, Bill, from Middlesbrough, who served with The Green Howards. Mr Cheall said: “I had been editing dad’s memoirs for publication and built a website. “Shortly before war was declared in 1939, he was on holiday with some pals and mentioned the car he was driving. The email was from current owner Ian Binnie, from Oxfordshire. Mr Cheall said: “I was really choked by this as I had no idea that the car still existed.” He took up an invitation to visit the car and drove from his home in Norfolk to see it. He said: “It was a memorable experience to see my father’s first car and to sit where he had sat back in 1936. Ian even let me have a drive in it.” The publication of his father’s memoirs prompted a search for comrades or friends who come from Middlesbrough, Stockton and the surrounding areas. 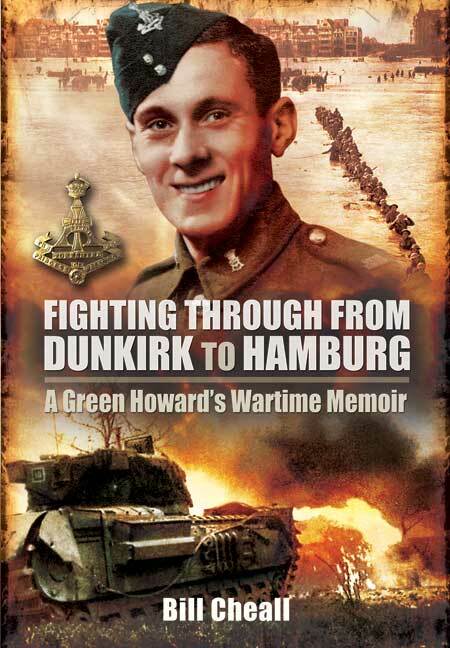 Mr Cheall has published a book of his father’s memoirs, titled Fighting Through From Dunkirk to Hamburg. It tells the story of an ordinary soldier in The Green Howards during the Second World War. Mr Cheall Sr was evacuated from Dunkirk in 1940, serving in North Africa, before his regiment was ordered back to England to form the vanguard of the Normandy invasion in 1944. He was wounded in the fierce fighting that followed the D-Day landings, and fell in love with his nurse after he was taken to hospital. He earned seven medals and a wounded-in-action stripe before being discharged in 1946, running the family grocery business until he retired. He died in 1999. Mr Cheall will give a talk at The Green Howards museum in Richmond, North Yorkshire, at 7pm on Friday, July 17, 2011. Bill Cheall’s story is a remarkable one, in that it is written with compassion. His story shows us that the companionship found within the regiment provided the bond that enabled the men to endure many hardships, much danger, sudden death, injury and lengthy periods of routine and training. The book is an absorbing one, and is highly readable. It is valuable in providing a picture of war seen from the point of view of an ordinary soldier, and is a story that every member of the Green Howards family should be encouraged to read. But the story, being a very human one, should be read by others as well. Paul Cheall Radio Interview - Listen to Editor Paul Cheall's interview with Nicky Campbell on Radio Five Live, aired on 15th June 2011. Bill Cheall left school aged 14 and worked in the family grocery business. He died in 1999 at Cambridge. The Editor - Paul Cheall, Bill’s son, started a business selling car insurance on the internet and he is now semi-retired. He lives in Norfolk.